Sitting in sound-proof booths, interpreters work in half-hour shifts, two per language, interpreting a speech as they hear it through their headsets. No time is wasted. One language is translated immediately and simultaneously into another or several other languages. This interpretation mode suits all kinds of multilingual meetings. At smaller meetings, interpreters sit among the participants, listen and take down notes and interpret consecutively when the speaker stops. This method of interpretation is more time-consuming, less frequently used but no less demanding than simultaneous interpretation. 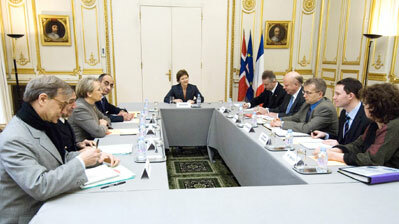 As a member of Oslo Promotion, SimNet is involved with the major local stakeholders in the congress sector. An important part of our work is to advise and assist organisers in meeting the language requirements of their conference. Thanks to our professional experience and membership of AIIC's worldwide network, we are able to set up the right team for the right job at the right price, whatever the number of languages. 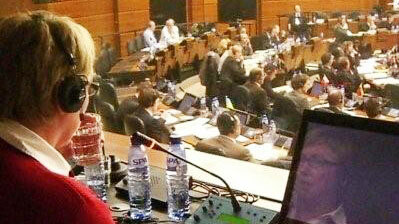 We can also recommend professional and experienced simultaneous interpretation equipment suppliers.